Access to the library is restricted to the Northwestern Law community after 6 p.m. weekdays and on weekends. Northwestern law students, faculty, and staff must swipe their Wildcard at the library doors to gain entrance after 6:00 p.m. on weekdays and on the weekend. Northwestern Law faculty, students and visiting scholars may use library facilities after the circulation desk closes. See the After Hours Policy for additional details. The library will be closed on Monday, January 21 for Martin Luther King Jr. Day. Regular academic year hours resume on Sunday, March 31. During reading periods and final examinations, access to the library is generally restricted so that Northwestern law students can study and take exams. During this time, the only students who are admitted are Northwestern law students. Students from other universities or Northwestern students outside the law program will not be admitted. Lawyers requiring the research materials may be admitted as under the Usual Access Policy, but are expected to maintain silence for the benefit of students. On Thursday, May 9 the library will be open 8:00 am - 8:00 pm. Summer hours begin on Friday, May 10. 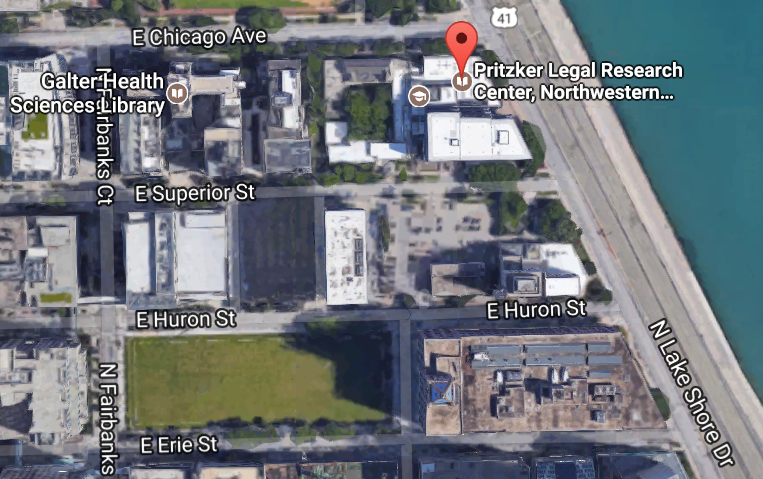 We can be found on the 2nd floor of the Arthur Rubloff building at 375 E. Chicago Avenue. The Rubloff Building is approximately 3 blocks east of Michigan Avenue at the corner of Chicago Avenue and Lake Shore Drive.